Combine the milk and water in the bowl of your electric stand mixer. Stir in the yeast and honey, then add the olive oil. Let sit until foamy, about 15 minutes. Add 2 1/2 cups of the flour, the salt, the egg, cheese and pesto. Beat on medium-low speed with the paddle attachment until just combined, then switch to the dough hook. Add in the remaining flour while the mixer is kneading on low speed. Knead the dough for 5 to 6 minutes – it should be slightly sticky but still pull away from the sides. If it’s super sticky, add a bit more flour until it appears silky. Remove the dough and place it in a well-oiled bowl. Cover it with a towel and let it rise in a warm place until it’s at least doubled in size, about 1 1/2 to 2 hours. Place the dough on a floured surface and knead it a few times, the break or cut it into 12 or 14 equal pieces. Preheat the oven to 350 degrees F. Brush a large oven-safe skillet with melted butter. Form the dough into equal sized balls (or rolls), and brush them with melted butter as well, placing them in the skillet. Sprinkle the dough with the fontina, pushing it in between the balls of dough. 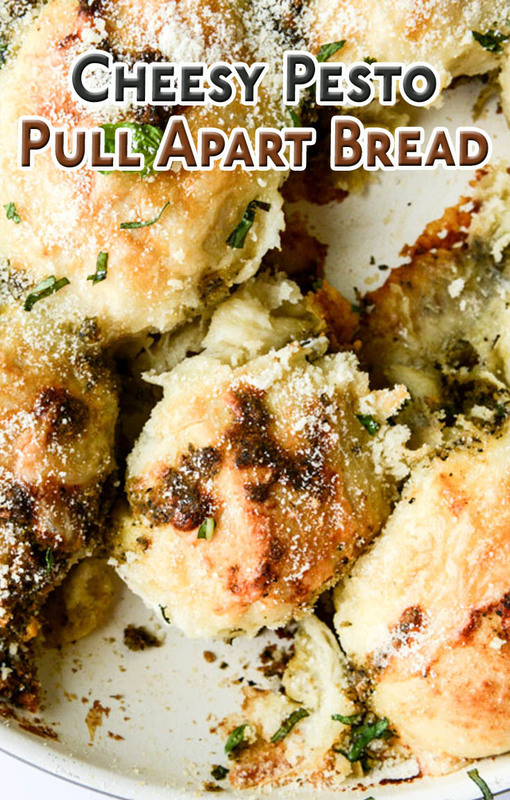 Spread the pesto on top and in between the rolls as well. Bake for 30 to 35 minutes, or until the tops are golden and set. Remove the bread and sprinkle it with extra parmigiano-reggiano and basil leaves. Serve immediately while warm.